Breakast Pizza with cheese, garlic, bacon and Maple syrup | Is Life a Recipe? Yes my friends I did get this right, yes I did make a pizza for breakfast, and yes it was a pizza with Maple syrup. This is the recipe for my Breakfast Pizza with cheese, garlic, bacon and Maple syrup. It was inspired by my youthful trips to USA and Canada, where you can have just the weirdest concoctions of breakfast options sometimes; like steak and eggs with water melon all on the same plate, bacon and eggs with pancakes and maple syrup etc. So anyways here is something different for the family Kennett breakfast this day today. It turned out to be an absolute belter – I think you are going to love it!!! Now I think that looks bloody good, even if I do say so myself – damn fine!!! Out she comes again, drizzle all over with Maple syrup and serve away. Now folks come on how easy was that. So easy it is not funny in fact. Any one could do that dish. It comes out as a savoury, sweet, crunchy, cheesy, garlic-fest – what a breakfast. An absolute cracker. 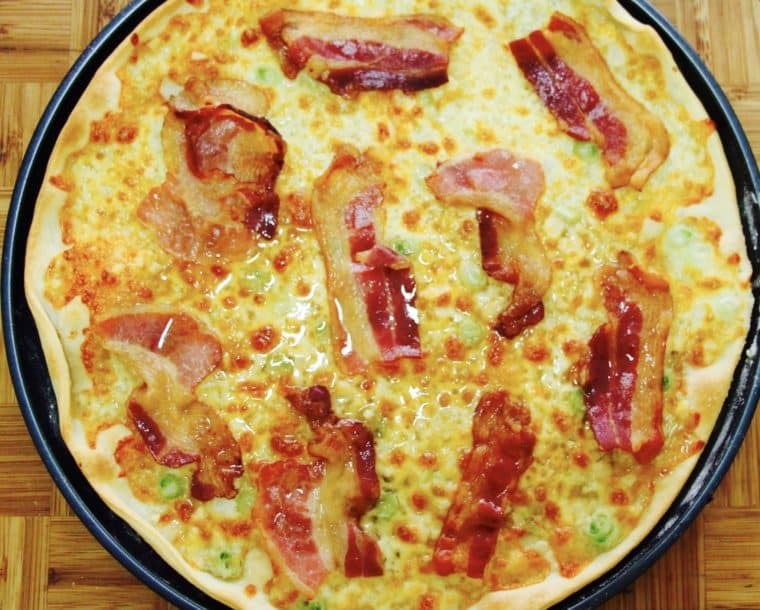 You simply must try my Breakfast Pizza with cheese, garlic, bacon and Maple syrup. It’s a cracker – ENJOY!!! No Replies to "Breakast Pizza with cheese, garlic, bacon and Maple syrup"